Say you run a fencing company and you use Quick Base to track your projects and tasks. You can't string your client's fence until Bertha's dug the post holes and Mac has installed the posts. In Quick Base, how do you keep all these tasks in their proper order? You do so by linking a task to predecessor tasks. Tasks in a project usually occur in a specific order and, as in the fencing example, one task cannot start until another task finishes. This means that one task depends on another one. A predecessor task is a task that must finish before another task can begin. When you specify a predecessor for a task, you set up a dependency between two tasks (which is why predecessors are sometimes also called dependencies). A successor task is a task that cannot start until another task finishes. When you link a task to a predecessor, you link their dates together. 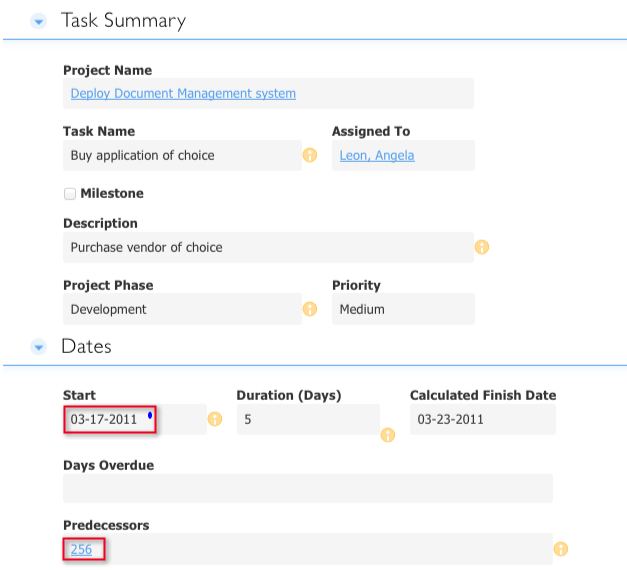 The projected Finish Date of a predecessor task automatically becomes the Start Date of a successor task. If you make changes to a predecessor's Start Date or Duration, Quick Base automatically updates the Calculated Finish Date. That finish day automatically carries over into the Start Date field of the successor task. For instance, if it rains on Tuesday, Bertha can't dig post holes until Wednesday. When she pushes that task's start date back one day, Quick Base automatically changes the start date of Mac's successor task (installing fence posts) to reflect the one day delay. alerts you by displaying a blue dot ( ) in the Start field. Project management apps built by the Quick Base team come with predecessors built-in. To see this feature in action, create an application using a project management app from the Exchange. You can also add predecessors to any project management application. FAQ - I can't edit the Calculated Finish Date. How can I adjust a predecessor's finish to change a successor's start? The Calculated Finish Date is exactly what it says it is: calculated automatically by Quick Base. You cannot edit this date. To change the Calculated Finish Date, change either the Start Date or the Duration of a task. When you do so, the Calculated Finish Date automatically changes. When it does, that new date will carry over into to any successor tasks, changing their Start Dates. Tip: When calculating the length of time a task will take, Quick Base automatically skips weekends. Application administrators can change the work week to include weekends.